What are symptoms and signs are associated with kidney pain? 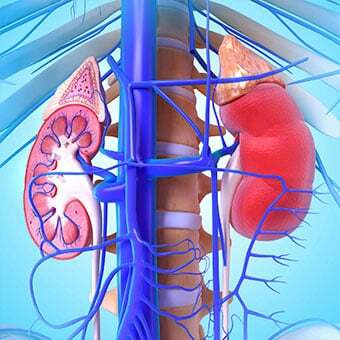 What are some of the kidney conditions and diseases that cause kidney pain? When should someone see a doctor about kidney pain? What are common tests are available to diagnose kidney diseases? 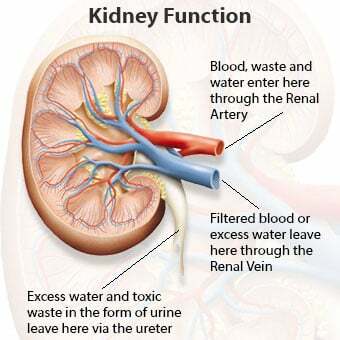 The function and purpose of the kidneys are to remove excess fluid and waste products from the body. The kidneys are organs that are located in the upper abdominal area against the back muscles on both the left and right side of the body. 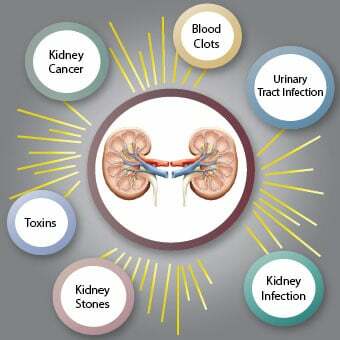 Causes of kidney pain are mainly urinary tract infections and kidney stones. However, there are many other causes of kidney pain, including penetrating and blunt trauma that can result in a "lacerated kidney." If a woman is pregnant and has kidney pain, she should contact her doctor. Kidney pain can be on the left, right, or both sides. Causes of kidney pain are diagnosed with the patient's history, physical examination, and lab tests, including blood, pregnancy, and urine tests. A CT scan or MRI of the abdomen and pelvis may be ordered. Treatment for the cause of kidney pain depends upon the underlying cause, but in general, ibuprofen (Motrin), ketorolac (Toradol), and/or acetaminophen (Tylenol) are used for pain. Antibiotics are usually required if the underlying cause is bacterial infection. Some people can pass a kidney stone spontaneously that resolves kidney pain; however, other people may need surgery. Kidney pain can be prevented by avoiding those situations that are the underlying causes of kidney infection and/or damage. The prognosis for someone with kidney pain depends upon the cause, and the majority of patients can have a good outcome when treated quickly and appropriately. Kidney stones form within the kidney or urinary tract. Kidney stones that do not produce symptoms are called "silent" stones. When symptoms do occur, they usually come on suddenly and include excruciating cramping pain in the low back and/or abdomen, side, or groin. Changing body positions does not relive the pain. 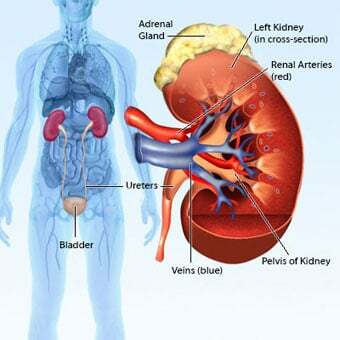 The kidneys are two organs whose major functions are to remove waste products and excess fluid from the body and to produce hormones that regulate blood pressure, red blood cell production, acid regulation and to influence calcium, sodium, potassium and other electrolyte metabolism. The kidneys are bean-shaped organs (about 11 cm x 7 cm x 3 cm) that are located against the back muscles in the upper abdominal area. They sit opposite each other on both the left and right side of the body; the right kidney, however, sits a little lower than the left to accommodate the size of the liver. The excess waste products and excess fluid are removed when the kidneys produce urine that is excreted from the body. Moreover, the kidneys play an important role in regulation of the body salt, potassium, and acid content. The kidneys also produce hormones that stimulate the production of red blood cells that help regulate blood pressure and help control calcium and electrolyte metabolism in the body. swelling and shortness of breath. Depending on the underlying cause, kidney pain may occur on the left or right side. Sometimes it can occur on both sides of the back; traumatic kidney injury (kidney laceration) may cause the above symptoms, but mild damage may initially have no symptoms. Severe kidney lacerations can cause abnormal blood pressure and pulse, and shock. Although kidney pain often occurs on one side of the back, it can occur on both sides at the same time and may radiate toward the abdomen or groin. Pain that occurs suddenly, is sharp, severe, and may increase and decrease in waves is often due kidney stones in the ureters of the kidneys. Pain caused by kidney stones is termed renal colic. Many of the causes of kidney disease that lead to kidney pain (also termed flank pain) are due to acquired underlying diseases that may acutely or chronically affect kidney function. Other diseases are present at birth. Some people may be born with an abnormality that is genetically determined that affects the kidneys. Individuals should not postpone seeing a doctor about kidney pain or flank pain. 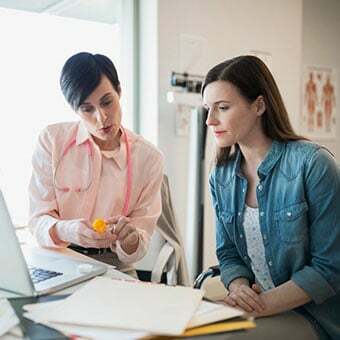 Although flank pain is often seen in underlying problems with the kidney, there are many other diseases that can mimic kidney pain, and a physician can help with an accurate diagnosis of underlying problems that result in kidney or flank pain. Any acute onset of intense kidney or flank pain should be evaluated immediately. In addition, if an individual has diabetes or any of the congenital problems that lead to kidney dysfunction, the individual should be routinely checked for the onset of kidney dysfunction or kidney failure by their physician. The doctor usually will do a history and physical examination. Initial tests usually consist of a complete blood count (CBC), kidney function (creatinine and BUN), and urine test, and when appropriate, a pregnancy test. A lacerated kidney may be suspected if the person has experienced a traumatic injury to the lower back. If kidney stones are suspected, a CT exam (renal protocol or noncontrast spiral CT) or renal ultrasound is done; an abdominal X-ray (KUB) may be ordered but has been replaced in general by ultrasound and CT. As patients with kidney stones often need repeat X-ray studies or have repeat episodes of kidney stones, ultrasound with its lack of radiation is a good study to consider. Abdominal/pelvic CTs with contrast or magnetic resonance imaging (MRI) and aortogram may be ordered to further define or differentiate underlying kidney (renal) and nonrenal causes of flank pain. Such studies are routinely performed if a kidney is suspected to be damaged by a traumatic event (auto accident, gunshot wound, or blunt trauma such as from a collision in football or workplace injury). Kidney pain (flank pain) treatment depends on the underlying cause of the pain. 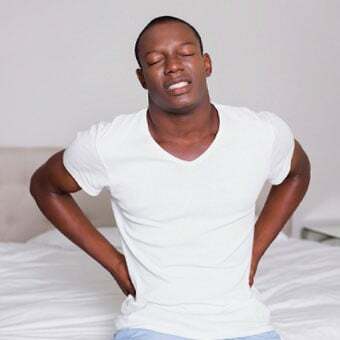 Infections and kidney stones that cause pain are often treated with ibuprofen, ketorolac (Toradol), acetaminophen (Tylenol and others), or occasionally with small amounts of morphine (kidney stones). However, these agents treat pain (pain relief only) and not the underlying cause(s) of pain. 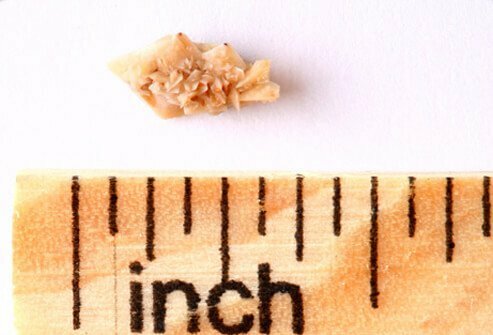 However, some patients may spontaneously pass (urine sweeps the irritating kidney stone out of the ureters and/or urethra) small kidney stones (usually less than about 6 mm in diameter) and then be pain-free. Infections like urinary tract infections (UTIs) and pyelonephritis usually require antibiotic treatments in addition to pain medications. If kidney stones completely block a ureter or are about 6 mm in diameter or larger, they may require urologic surgery. Usually, recovery time is fast (same day or a few days) if kidney stones are removed by retrograde surgical techniques. However, some severe kidney lacerations may require more extensive surgery. Recovery time for these surgeries varies from weeks to months. Other underlying causes of flank pain may need similar pain management and concurrent treatments. However, patients with known kidney problems (kidney disease) and/or renal function compromise should not be treated with pain medications that are either filtered (removed) through the kidneys and/or may cause further renal damage. Dave, C., MD. "Nephrolithiasis." Medscape. Updated: Dec 03, 2016. Kidney.org. "Pain in Kidney and Urine Diseases." Updated: Jun 21, 2017. National Kidney Foundation. 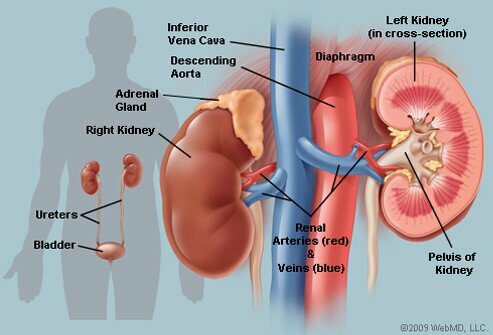 "How Your Kidneys Work." Gill, BC, MD. "Causes of Flank Pain." Medscape. Updated: Jun 13, 2016. Please describe your experience with kidney pain. What treatments were effective for your case of kidney pain?